The finished cake with the edge of the spring-form pan removed. The cooked noodles stacked in the spring-form pan. The meat sauce has been poured on top of the ziti noodles. This recipe is a new twist on the traditional Italian ziti bake dish. I use a spring-form pan and stand the noodles up on their ends to make it look like a cake! Boil the ziti on the stove top. You'll want it a little al dente, because this will be in the oven later. 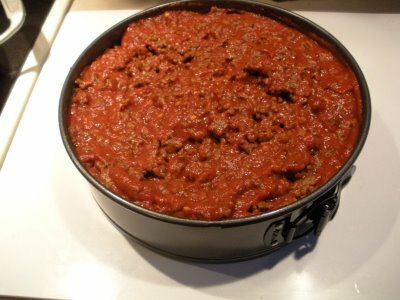 When the ziti is done, drain it and stack the noodles in a spring-form pan that was coated lightly with some cooking spray. Brown the ground beef on the stove on medium heat. Chop the meat up into small pieces while it browns - the smaller the pieces the easier it will fit into the ziti noodles. When the beef is done cooking drain the fat and add the rest of the sauce ingredients (crushed tomatoes, tomato paste, garlic, basil, and oregano). Stir the sauce to mix it well and remove it from the heat. Pour the sauce on top of the noodles and spread it around, making sure to get as much of it as possible down into the noodles. If some of the ground beef is still on top that's okay. Top the dish with the shredded mozzarella cheese and stick it into a 350 degree oven for 10-15 minutes until the cheese is melted and beginning to brown. 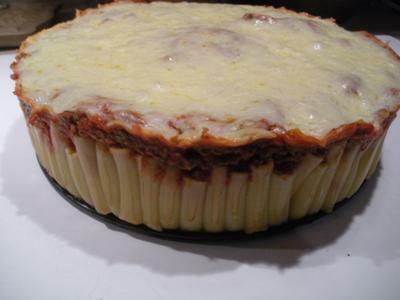 During the baking process the ziti will stick together nicely, allowing you to remove the outside of the spring-form pan and slice this just like a cake. This dish serves 4-6, depending on how hungry you are. Your dish looks good enough to be dessert - that means I get seconds right? How bout letting them stand the ziti up!! I am a Ziti fan in general, and this recipe looks great! This was a brilliant idea. Taking the everyday pasta dish to new heights with a sophisticated presentation. Delicious!